Antonio Rondon Senzatela … resides in Valencia, Venezuela in the offseason … married to Vanessa Carolina Garcia Iraci and together they have a son, Thiago ... Son of Antonio Senzatela and Nidya Yusbelis Rondon … his mother Nidya passed away due to cancer in July 2016 … has two older sisters, María and Yesica, and one younger sister, Antonella ... Began playing baseball at the age of four … his dad bought him his first glove and his grandfather, a carpenter, made him a tiny wooden bat he used to love to swing ... Attended school at Alonso Díaz Moreno and Virgen de las Nieves, both located in Valenica, Ven. In 23 appearances with the Rockies, went 6-6 with a 4.38 ERA (90.1 IP, 44 ER), 30 walks and 69 strikeouts ... As a starter, went 4-5 with a 3.95 ERA (73.0 IP, 32 ER) … made 10 relief appearances, going 2-1 with a 6.23 ERA (17.1 IP, 12 ER), six walks and 14 strikeouts, before being optioned to Triple-A on May 2 ... According to STATS, on April 27 at Miami, became the first relief pitcher in Rockies history and the first in the Major Leagues since Joe Niekro on Aug. 23, 1980 to earn the win and drive in the game's only run in a 1-0 victory … it was also the first game in Rockies history in which all runs were driven in by a relief pitcher ... In eight games with Triple-A Albuquerque, went 3-1 with a 2.15 ERA (37.2 IP, 9 ER), 30 walks and 69 strikeouts ... Made his first career postseason appearance, starting Game 1 of the NLDS at Milwaukee … pitched five innings and allowed two runs on three hits with two walks and one strikeout. Made his first career Opening Day roster and made his Major League debut on April 6 vs. Milwaukee Brewers at Miller Park ... Went 10-5 with a 4.68 (134.2 IP, 70 ER) across 20 starts and 16 relief appearances … his 102 strikeouts the 11th-most by a Rockies rookie in a single season ... As a starter, went 10-5 with a 5.03 ERA (111.0 IP, 62 ER) with 39 walks and 79 strikeouts ... National League Rookie of the Month for April, after going 3-1 with a 2.81 ERA (32.0 IP, 10 ER) in five starts … finished the month first among Major League rookie starting pitchers in ERA and innings pitched, tied for first in wins and tied for fourth in strikeouts ... Pitched seven innings in three consecutive starts from April 11-22, becoming the first Rockies pitcher since Jhoulys Chacin in 2013 (four starts) to accomplish the feat ... Pitched eight shutout innings May 26 vs. St. Louis, allowing five hits with no walks and three strikeouts ... Moved to the bullpen for the month of September … as a reliever, received no decisions and recorded a 3.04 ERA (23.2 IP, 8 ER) with eight walks and 23 strikeouts in 16 appearances ... His 10 wins were tied for third-most among Major League rookie pitchers (also: Parker Bridwell, Los AngelesAL) … ranked first among rookies with a .667 winning percentage. Went 4-1 with a 1.82 ERA (34.2 IP, 7 ER) for Double-A Hartford across seven starts,spending much of the year on the disabled list...On the 7-day disabled list from April 17 to May 23 and again from June 22 through the rest of the season with a right shoulder strain … pitched two times in the month of April, two times in May and three times in June...Was 2-0 with an 0.60 ERA (15.0 IP, 1 ER) in three June starts … made his final start on June 15, allowing one hit with two walks and four strikeouts over four innings...Went 2-0 with an 0.82 ERA (22.0 IP, 2 ER) in four starts at home … was 2-1 with a 3.55 ERA (12.2 IP, 5 ER) in three starts on the road. Went 9-9 with a 2.51 ERA (154.0 IP, 43 ER) across 26 starts for High-A Modesto and was named as the California League's Pitcher of the Year…Was named a Baseball America High Class A All-Star…Became a Mid-Season All-Star after going 4-3 with a 2.36 ERA (72.1 IP, 19 ER), 56 hits, five home runs, 18 walks and 71 strikeouts over 13 first-half starts…At the conclusion of the season, was named a Post-Season All-Star after going 5-6 with a 2.64 ERA (81.2 IP, 24 ER), 75 hits, five home runs, 15 walks and 72 strikeouts over 13 second-half starts…Pitched a season-high eight innings in two consecutive starts, July 18 vs. Lake Elsinore and July 24 at Visalia. Started 26 games for Low-A Asheville in his third professional season, going 15-2 with a 3.11 ERA (144.2 IP, 50 ER) ... Led the South Atlantic League with 15 wins ... Went 8-1 with a 1.84 ERA (73.1 IP, 15 ER) in 13 second-half starts ... Named MiLB.com Organization All-Star and was ranked the eighth-best prospect in the Rockies organization by Baseball America. Began the season with the Dominican Summer League Rockies before joining Short-Season Tri-City July 21 ... Went 6-1 with a 1.76 ERA (51.0 IP, 10 ER), 32 hits, one home run, three walks and 46 strikeouts for the DSL Rockies, including a 4-0 record at home with a 1.07 ERA (33.2 IP, 4 ER), 18 hits, one walk and 32 strikeouts ... Went 2-4 with a 3.83 ERA (42.1 IP, 18 ER) with 48 hits, one home run, 13 walks and 20 strikeouts in eight starts for Tri-City. Made his professional debut with the DSL Rockies and made 12 starts and one relief appearance ... Went 5-2 with a team-leading 0.72 ERA (62.2 IP, 5 ER) with 40 hits, 14 walks and 35 strikeouts. April 15, 2019 Colorado Rockies activated RHP Antonio Senzatela from the 10-day injured list. April 6, 2019 Colorado Rockies sent RHP Antonio Senzatela on a rehab assignment to Albuquerque Isotopes. 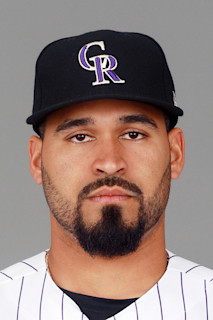 March 28, 2019 Colorado Rockies placed RHP Antonio Senzatela on the 10-day injured list retroactive to March 25, 2019. Blister infection on right heel. August 18, 2018 Colorado Rockies activated RHP Antonio Senzatela from the 10-day injured list. August 5, 2018 Colorado Rockies placed RHP Antonio Senzatela on the 10-day disabled list retroactive to August 3, 2018. Right shoulder inflammation. July 22, 2018 Colorado Rockies activated RHP Antonio Senzatela from the 10-day disabled list. July 13, 2018 Colorado Rockies placed RHP Antonio Senzatela on the 10-day disabled list retroactive to July 10, 2018. Left middle finger blister. July 3, 2018 Colorado Rockies recalled RHP Antonio Senzatela from Albuquerque Isotopes. May 26, 2018 Albuquerque Isotopes activated RHP Antonio Senzatela from the 7-day disabled list. May 19, 2018 Albuquerque Isotopes placed RHP Antonio Senzatela on the 7-day disabled list retroactive to May 17, 2018. May 3, 2018 Colorado Rockies optioned RHP Antonio Senzatela to Albuquerque Isotopes. July 18, 2017 Colorado Rockies recalled Antonio Senzatela from Albuquerque Isotopes. July 8, 2017 Colorado Rockies optioned RHP Antonio Senzatela to Albuquerque Isotopes. October 3, 2016 Colorado Rockies recalled Antonio Senzatela from Hartford Yard Goats. September 26, 2016 Hartford Yard Goats activated RHP Antonio Senzatela from the 7-day disabled list. June 25, 2016 Hartford Yard Goats placed RHP Antonio Senzatela on the 7-day disabled list. May 23, 2016 Hartford Yard Goats activated RHP Antonio Senzatela from the 7-day disabled list. April 20, 2016 Hartford Yard Goats placed RHP Antonio Senzatela on the 7-day disabled list retroactive to April 17, 2016. March 29, 2016 RHP Antonio Senzatela assigned to Colorado Rockies. March 18, 2016 Colorado Rockies optioned RHP Antonio Senzatela to Hartford Yard Goats. November 20, 2015 Colorado Rockies selected the contract of Antonio Senzatela from Modesto Nuts. November 10, 2015 RHP Antonio Senzatela assigned to Navegantes del Magallanes. April 4, 2015 RHP Antonio Senzatela assigned to Modesto Nuts from Asheville Tourists. March 31, 2014 RHP Antonio Senzatela assigned to Asheville Tourists from Tri-City Dust Devils. July 18, 2013 RHP Antonio Senzatela assigned to Tri-City Dust Devils from DSL Rockies. June 1, 2012 Antonio Senzatela assigned to DSL Rockies. July 8, 2011 Colorado Rockies signed free agent RHP Antonio Senzatela to a minor league contract.